SINGAPORE—Kramer Electronics has supplied nine 16-output HDMI Distribution Amplifiers to consumer electronics retailer Audio House for the installation of what is claimed to be the longest HDTV wall in Asia. The HDTV wall is more than 100 meters in length and is dedicated to showcasing plasma and LCD screens of sizes from 32 up to 70 inches. The HDTV wall at Liang Court showcases flat-panel displays in sizes ranging from 32 to 70 inches. the new Audio House store, which occupies some 50,000 square feet at the Liang Court shopping mall in Singapore. 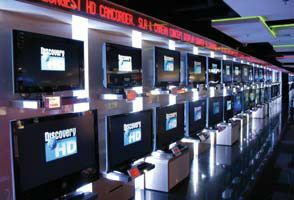 Long-established integrator ETG was given the task of transporting HD content from set-top boxes and Blu-ray players not just to the HDTV wall, but throughout the store, which has space for over 100 flat-panel displays.